Creating profiles for the members within a team takes DISC into a new dimension of analysis with Discus Team Building. There are many factors that can influence the effectiveness and performance of a team, but the team members' personalities will clearly be among the most important of these. If we create a DISC profile for every member of a team, then it becomes possible to model the workings of that team, and to anticipate the ways the team will operate. Indeed, we're not limited to existing teams: it's just as possible to combine members for a potential team, and experiment with different combinations to find the optimum group. Discus facilitates all this with an easy-to-use team management system that lets you model and adjust any combination of profiles, and immediately view the results. At the heart of the Discus team assessment is its Team Profile, which draws in all the factors of the team's members to create a single graphic describing the team as a whole. This team profile follows the familiar four-factor layout of a conventional DISC profile, but the factors themselves are different, using terms like Direction and Participation to measure the processes at work within the team. A quick overview of the team and its profile, giving you all the key facts. The most important features of personal relationships within the team. A graphical overview of the personality elements with the most impact on the team style. Drawing together all the members' profiles, in combination with the overall team profile, Discus can compose a detailed and extensive report about the team and its workings. That team report includes an overview of the team as a whole, with keynotes and comments on its structure, but it also goes on to explore a wide array of other aspects of the team. One of these other aspects is leadership. If you choose to assign one of a team's members as its leader, Discus will provide a thorough analysis of that person's leadership style, and it will also look at how that style matches the needs of the team. This makes it easy to highlight areas where the leader needs to focus their attention to get the most out of the other team members. A summary of each of the team's members, individually and as part of the team as a whole. Examining the team in terms of DISC roles, and breaking down to membership into those roles. Extensive leadership analysis, not only assessing the leader's style, but also the team's leadership needs. Understanding the roles at work within a team has always been a crucial part of team assessment, and Discus includes this aspect in its report too. 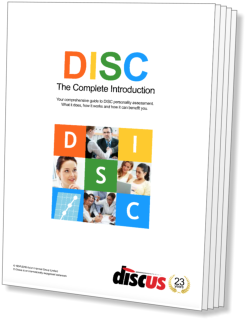 To do this, Discus draws a set of twenty-seven possible roles specifically designed to be compatible with members' DISC profiles. This approach can categorise members into roles such as Brainstormer, Consultant, Explorer, or any of many other types, each with a clear definition and explanation. Taken together, all these features and reporting options make Discus indispensable in planning or managing the operation of a team. Discus makes it easy to set up a team, allowing you to define existing groups or model potential combinations of personalities. You can check the Discus team report at any time to review the ways that any team will work together. Discus Team Profiles: The basis of team assessment with Discus is the team profile, combining members' DISC profiles into a single overall form. Modelling Teams: Discus allows you to set up and adjust any team, seeing the outcomes of your changes in real time. Team Reporting: Based on the makeup of a team, Discus will produce a detailed team assessment report, discussing the team's structure and its internal relationships. Leadership Assessment: If you assign a leader for a team, Discus will provide an assessment of their leadership style, and how that style fits with the needs of the group. Team Roles: Team members can also be broken down into any of a set of DISC-based roles, helping to show how they see themselves as a part of a working team. Free and Unlimited: Team profiling and reporting are a free and unlimited part of the Discus service. Registered Discus users can create any number of teams, and view Discus reports on those teams without restriction. See a Sample Report: Take a look at a Discus team report for yourself with our sample Discus Team Assessment.